While I was packing to head back to Cape next week I kicked a dusty box in the back of the closet. In it was a stack of View-Master reels. I don’t know why the were called reels, but that’s the name that shows up on the official Fisher-Price View-Master website. I didn’t dig though the box to see if the heavy, Bakelite viewer was in there. I’m disappointed. The viewers are selling for less than $20 on eBay. I guess it can stay hidden for a few more years. Not only did I have the stereoscopic viewer, which simulated 3-D by having two slides that you looked through at the same time that had been photographed by lenses slightly apart, but I had a View-Master projector, too. It ran on wall power and got so hot you could probably fry an egg on it. When you were traveling across the country, you had to pick up a bumper sticker and View-Master reel from just about every attraction you stopped at. In later years, View-Master started phasing out the scenics and started producing more cartoon characters and TV stories. I spent many a happy hour sliding those reels into the viewer, then reaching for the advance lever – click – slunk – new magic pictures. Unless, of course, the holes didn’t engage and you’d have to keep pressing the lever until they did. If you got impatient, you could bend the lever or even break it off. Patience, young man, patience. Quite a diverse collection. I finally got my parents to spring for a View-Master but to really enjoy one you needed to purchase reels that you hadn’t already looked at a thousand times. That kind of money was hard to justify in our house. Seeing 3-D color slides brightly lit by the sun had a little wow factor to it before color tv. I looked at one in a toy store a few months ago and still marveled at the color, clarity and depth perception. I kept moving the viewer around thinking that maybe if I did it just so…..that I could look around behind the objects. Viewmasters were cool, but they never made it into our house. I believe I was more interested in the old turn of the century images that were afforded with the old stereoscopes. I remember in the 70’s when the Viewmaster line was purchased by visual giant GAF and I can still hear Henry Fonda in his unique drawl hawking the GAF Viewmaster on TV commercials. I guess it is time to come out of the closet! I have been collecting view masters for years. I have two big boxes full of reels and view masters. They have been piled in the closet on the promise that some day I will get them out and catalog them. They came in packets of threes and I have one or two and occasionally a full packet. Some are of our era and some are the newer GAF brand. Not everything old is expensive so I started acquiring them because I could afford them. Even the Superman, Roy Rogers and Gene Autry, Lone Ranger sets can be obtained for around $20.00 a set. The pride of my collection is a set of ML Baseball players from 1953-1955 complete in a packet with the description inserts. 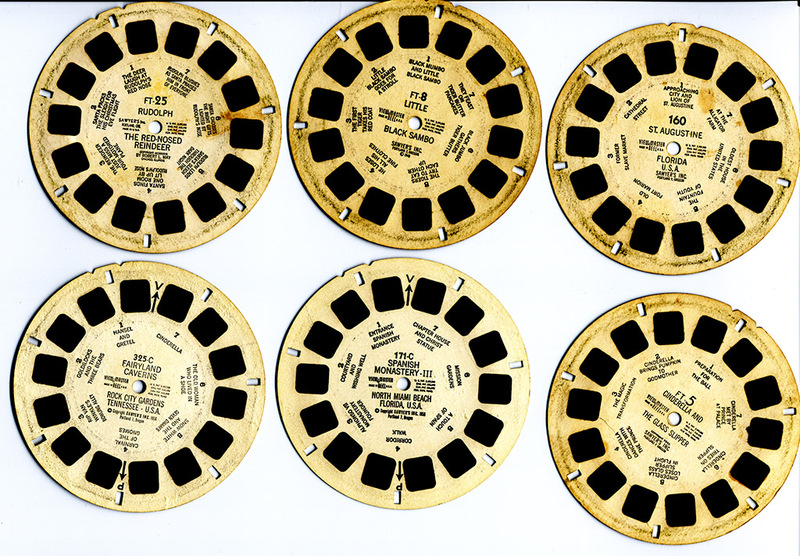 I noticed of the six reels you showed that three were some I remember as a kid-Rudolph, Sambo and Rock City. The original company was Sawyer. I have one I bought brown Bakelite one at a yard sale recently, thinking it might be worth more than it is. No matter – fond memories. The newer Viewmasters I’ve seen have a battery operated light in them. I prefer the old style you held up to the sun. Bill Hopkins: I’ll start hunting for old reels for you. Get busy and catalog them so I don’t get you duplicates! Wrong Bill, Jan. The View-Master collector is Bill STONE, not Bill HOPKINS. I suspect you’ll be hearing from Mr. Stone’s attorney to talk with you about defamation of character. This was by far my favorite childhood Christmas gift. My favorite reels were: Snow White, and a reel showing Ntl. Park scenes. You have motivated me to hit the vintage shops. I want to see those scenes again. Thanks. Can’t wait to see you. I had a Viewmaster also and had forgotten about the wall projector. Our three kids were not nearly as impressed with the different reels as I was growing up. Of course, that was all before color TV and computers. I collect the old stereocards and ViewMasters, esp. with caves or nature subjects. I wasn’t aware of the projectors for ViewMasters. They had to project a mono view, so the advantage had to be group viewing – right? Previous PostPrevious Remember EDgewater? Or CIrcle?